Nutraceuticals « Global Market Insights, Inc. In the recent decades, the isoflavone market has registered a commendable year-on-year growth as research studies have continued to illuminate the positive properties of isoflavones. As data is piling up in support of isoflavones, which is class of phytochemicals (compounds found only in plants), health conscious consumers are turning towards the consumption of greater quantity of soybeans, chickpeas and other legumes, all of which are rich in isoflavones. Isoflavones are also a type of phytoestrogen that resembles human estrogen in chemical structure. By imitating the functions of human estrogen at certain sites in the body, isoflavones provide many benefits that can prevent illness and promote good health. Soybeans have found to be richest source of these powerful compounds as it not only contains many individual isoflavones, but also the most beneficial ones, namely, genistein and daidzein. With soy beans being increasingly consumed around world which has recently been gripped by veganism, the isoflavones market is also anticipated to gain commendable profits in the coming years. To elaborate on the benefits of isoflavones and especially that of genistein, it should be mentioned that genistein has the ability to block the buildup of harmful testosterones or dihydrotestosterone that is linked to prostate cancer and prostate enlargement as it acts as a natural inhibitor of the enzyme that converts testosterones in dihydrotestosterone. Besides this soy isoflavones have found to exhibit a number of other anti-cancer effects besides having antioxidant properties which protect the cardiovascular system from oxidation of LDL cholesterol. Oxidized LDL cholesterol is known to cause atherosclerosis by accumulating in the arteries as fatty buildup blocking the flow of blood. Arteries damaged by atherosclerosis usually form blood clots that can lead to a heart attack or even stroke. Genistein has properties that prevent artery clogging plaque. Rising incidence of cardiovascular disorders are one of the leading reasons that research into the benefits of isoflavones and consumption of soy beans is becoming stronger. With medical practitioners and nutritionists emphasizing the benefits of soy consumption, the soy isoflavones industry is receiving an immense impetus and is projected to record a CAGR of 13.5% over 2019-2025. Besides cardiovascular disorders, isoflavones have also been found to be functional for alleviating hormone dependent physiological disorders such as osteoporosis and postmenopausal symptoms. Isoflavones have proved to be better suited for treatment procedures that replace hormones such as estrogen hormone replacement therapy and shows none of the negative effects that occur too often with conventional therapies with hormones. For instance, studies have shown that estrogens can slow down the aging process of the skin in postmenopausal women. This has prompted many women to opt for hormone replacement therapies as the level of estrogen declines rapidly in postmenopausal women, speeding up the aging process. But with isoflavones having found favor in cosmetic formulations, not only for anti-aging benefits but also for treating irritating skin conditions including rashes, eczema and psoriasis, isoflavones industry has received a sizeable boost from the cosmetics market. Considering that anti-aging products are touted to garner commendable acclaim in 2019 and ahead, isoflavones market will register a massive increase in revenue from cosmetic applications over 2019-2025. Another reason that has helped isoflavones market is the stellar rise of popularity of a vegan diet. As consumers around the world have become aware of the ecological burden of meat and dairy consumption, veganism has rapidly become mainstream. Surveys have shown that more than 50% of Americans have come to support ban of slaughterhouses and around 70% have admitted to being uncomfortable with poor treatment of animals, which in part explains why veganism rose by 600% in the country between 2014 and 2017. The trend has been noted in other parts of the world as well with 8% of people in the UK being vegan in 2018 and Australians also showing similar trends. Rising incidence of disease and obesity has played its part in this surge of veganism. As such meat substitutes have become very popular and consumption of soy products like tofu and tempeh having registered a massive growth, has in turn added remarkable stimulus to the isoflavones market. 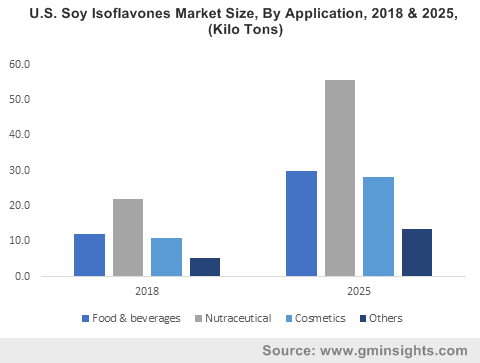 Considering that mindful eating and awareness of food components, including chemical content of food is gaining rapid popularity, the isoflavones market is expected to amount to $30 billion by 2025 in terms of revenue. This entry was posted in FOOD, NUTRITION AND ANIMAL FEED and tagged APAC Isoflavones Market, Chickpea, Europe Isoflavones Market, Global Isoflavones Market, Isoflavones Industry, Isoflavones Market, Isoflavones Market 2019, Isoflavones Market 2025, Isoflavones Market forecast, Isoflavones Market growth, Isoflavones Market outlook, Isoflavones Market PDF, Isoflavones Market report, Isoflavones Market share, Isoflavones Market size, Isoflavones Market statistics, Isoflavones Market trends, North America Isoflavones Market, Nutraceuticals, Red Clover, Soy Isoflavones Market, U.S. Isoflavones Market, World Isoflavones Market. Pertaining to the surging importance of soybean pertaining to its many medicinal benefits, soy chemicals market has emerged as one of the most profitable spheres of the healthcare cosmos. Experts assert that the consumption of soy can lead to a reduction in cardiovascular diseases, breast cancer, as well as cosmetic and dermatological problems. In addition, soy injections help patients with diabetes mellitus to improve metabolism. Considering the nutritional benefits of soy, most of the nutritionists have been encouraging the consumption of soy and its food derivatives that has resulted in the demand upsurge for soy-based drugs and food products on a large scale. On these grounds, several medical companies have been developing soybean oil-based medicines, providing a push to soy chemicals market trends. Nowadays, several restaurants and food companies have been making tall claims about having incorporated heart-healthy oils in their products such as dressings, bottled oils, baked goods, snacks, and dips to attract more consumers who have been trying to reduce the inclusion of saturated fat in their diet. The U.S. is one of the largest producers of soybean, accounting for more than 30 percent of worldwide production. In America, soybean is one of the most used ingredients owing to its health potential. In this regard, the U.S. Food and Drug Administration (FDA) has been providing suitable support to pharmacies and biomedical companies that have been involved in the development of soybean oil-based medicines for reducing the risks associated with coronary heart disease and cancer. Recently, the agribusiness and food ingredient company, Bunge North America received an approval from the U.S. FDA for its claim related to the consumption of soybean oil and its connection to coronary heart diseases. With its versatile portfolio, Bunge is continuously striving to disseminate the importance of soybean oil and its health benefits. Moreover, facilitated with in-depth scientific and clinical research, Bunge is looking forward to strengthening its business with strategic acquisitions and joint ventures. The growing North America soy chemicals industry is slated to generate such attractive business opportunities for players such as Bunge over the years ahead. Indeed, driven primarily by Canada, U.S., and Mexico, North America soy chemicals market, claim estimates, will register a CAGR of more than 5% over 2018-2024. In order to target the leading consumers of soybean and its food products, globally renowned companies have been establishing suitable partnerships to commercialize their activities by reducing import costs. Validating the aforementioned fact, on February 2018, Cargill and Archer Daniels Midland company formed a JV to supply soybean meal and oil across Egypt. This JV has also acquired the crush plant of the Egypt based oil company located in Borg Al-Arab. In addition, Cargill also has been investing to expand its daily crush capacity from 3000 metric tons to 6000 metric tons with which it will decrease the soybean meal imports in Egypt. This strategy will help Cargill to expand its business across Egypt and North Africa to enhance its customer base by supplying affordable, safe, and healthy food. With the adoption of such business tactics, the players in the soy chemicals market are aiming to utilize their existing facilities and infrastructure in order to meet the growing regional product demand. The increasing popularity of soybean oil and its byproducts among the manufacturers of consumer and industrial products over petroleum and other hazardous ingredients is slated to stimulate the industry trends over the years ahead. 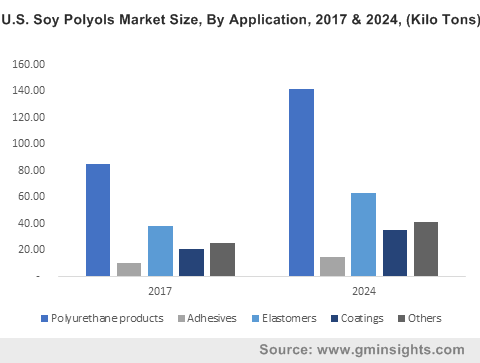 In addition to medicinal usage, the deployment of soybean products for manufacturing coatings, plastics, solvents, adhesives, rubber, and lubricants will also have a positive influence on business growth. Driven by the rising number of facility expansions, soy chemicals market size is anticipated to be pegged at USD 44.5 billion by the end of 2024. This entry was posted in Bulk & Specialty Chemicals and tagged Adhesives, Animal Feed, Candles, Coatings, Cosmetics, Dietary Supplements, Elastomers, Epoxidized Soybean Oil, Food & Beverages, Fuel Additives, Global Soy Chemicals Market, Industrial & Domestic Cleaning, Industrial Refined Soy Oil, Lecithin, Methyl Soyate, Natural Extracts, Nutraceuticals, Paints & Coatings, Pharmaceuticals, Plasticizers, Polyurethane products, Printing Inks, Soy Chemicals Market, Soy Chemicals Market Size, Soy Chemicals Market Trends, Soy isoflavones, Soy Oil Derivatives, Soy Polyols, Soy Wax, Tocopherols, UV Cure, Vitamin E.
The escalating scientific and commercial interest in xylitol is making the global xylitol industry an appealing commercialization proposition. The growing health consciousness among people has directly influenced the business landscape of the global xylitol market. Its properties of being used as a low-calorie substitute for traditional sweeteners is assisting its penetration across a myriad range of sectors such as personal care, food, pharmaceuticals, confectionary, and nutraceuticals. In addition, the rising healthcare expenditure, which has been indeed addressed as a global concern is further providing a significant impetus to the overall xylitol industry space. The U.S. is one of the prominent countries facing the healthcare costs burden profoundly. The trends depict that obesity is one of the leading causes of this rising expenditure, being the source of several other ailments such as diabetes, cardiac disorders, physical disabilities, etc. According to WHO, globally over 2.8 million people die from obesity and the consequent ailments on an annual basis. 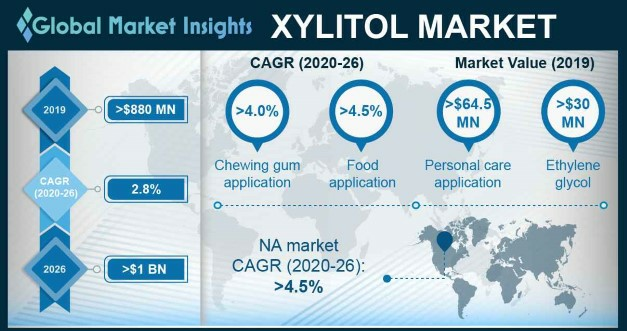 To combat the rising concerns regarding healthcare expenditure as well as to ensure sound health of the global population base, xylitol market has observed massive gains over the recent years. Xylitol has become a prominent name in the overall polyol industry space and had attained a remarkable revenue of USD 750 million in 2015. Through consumption via medicines and food, xylitol serves as a major solution to the issues related to obesity. This has subsequently enhanced the application portfolio of xylitol industry in the food and pharmaceutical sectors. As per the estimates, xylitol market size from food applications is estimated to register the highest CAGR of 7% over the period of 2016-2023. Owing to the medicinal properties, chewing gum applications led the overall landscape with a revenue record of over USD 450 million in 2015. The growth can be credited to the ability of xylitol based chewing gums to prevent dry mouth, tooth decays, and cavity progressions. As per the estimates, xylitol market share from chewing gum applications is estimated to record a CAGR of 6% over the timeframe of 2016-2024. Personal care industry is also one of the prominent contributors toward the overall xylitol market share. This application is poised to witness a substantial growth rate over the coming years, driven by its usage in fluoride tablets, mouthwash, and toothpaste. The U.S. xylitol industry is expected to surpass a revenue of USD 350 million by 2023. The food applications in this region are likely to drive the product demand with a CAGR of 5.4% over the period of 2016-2023. Germany market is estimated to witness substantial growth over the coming seven years having held a revenue of USD 65 million in 2015. Chewing gum application is likely to drive the regional demand. China is estimated to be the major avenue for the overall xylitol industry growth over 2016-2023, with a target market size of 25 kilo tons by 2023. The huge regional confectionary base worth USD 9.5 billion is the major factor boosting the market trends. France market is estimated to grow at an annual rate of 5.5% over the coming six years, driven by the rising obese and diabetic patient base. Brazil personal care application is projected to exceed a revenue margin of USD 1.7 million by 2023. The industry is consolidated with the top four players- Futaste Pharmaceutical, Danisco (DuPont), Yucheng Lujian Biological Technology Co. Ltd., and Hangzhou Shouxing Biological Technology Co. Ltd. sharing 40% of the overall business space. With a strong production base in China, the region has become a prominent export destination. Pricing is one of the chief parameters ruling the competitive scenario. Despite the industry growth restraints including- tight raw material (corncob) supply and product substitute threat through the replacement by other sugar polyols such as sorbitol, maltol, and mannitol, the xylitol industry will sustain its valuation in the coming years with the diversified application spectrum across the end-use sectors. Global Market Insights, Inc. estimates the xylitol market to surpass a revenue of USD 1 billion by 2023. This entry was posted in BIOMASS, BIOENERGY AND RENEWABLE CHEMISTRY and tagged Chewing Gum, Confectionary, Ethylene Glycol, Food, Global Xylitol Market, Nutraceuticals, Personal Care, Pharmaceuticals, Propylene Glycol, Xylaric Acid, Xylitol Market, Xylitol Market Demand, Xylitol Market Price, Xylitol Market Size, Xylitol Market Trends. 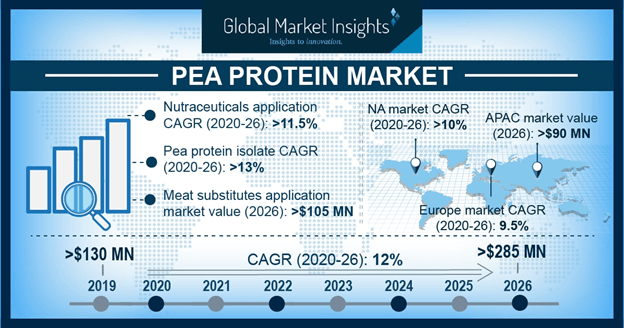 The global pea protein market is set to traverse alongside a highly lucrative growth chart, particularly on account of the ongoing trends toward vegetarianism, veganism and flexitarian habits. It is prudent to mention that millennials are the main drivers of this plant-based movement, with everyone from celebrities, athletes, social media influencers to major corporations supporting the same. According to the latest research, there’s been a worldwide increase in veganism from 2014 to 2018, including top regions like Australia, New Zealand and Canada. The United States has witnessed a 600% increase in people identifying as vegans over the last three years. The number of people identifying as vegans in the UK has gone up by 350% and vegetarianism in Portugal surged by 400% over the last decade. Given the worldwide shift away from consuming animal products, the global pea protein market will witness a hefty demand as the consumption of vegan protein sourced from peas will increase. Plant-based diets are growing across the world and are immensely supported by small-scale as well as major food and beverage corporations who are positively responding to consumer’s changing food preferences. For instance, in August 2018, coffee giant Starbucks launched its first-ever vegan protein cold brew drinks. The drinks were made with slow-steeped Starbucks Cold Brew and alternative plant-based proteins made from pea and brown rice. Another instance worth mentioning is Dubai-based airline Emirates using over 170 vegan recipes to suffice increasing vegan meal requests. Their efforts even earned them the Best Airline for Vegan Meals title in a poll by Vegan News. In addition, the emergence of modern vegan restaurants will further boost product demand. For example, the Etsy Headquarters in Brooklyn is about to receive a 4,500 square foot vegan eatery. Meanwhile, Tokyo International Airport, which is the world’s fourth most traveled airport got its first 100% vegan café to meet the growing demand for plant-based food and beverage by tourists visiting Japan. As more and more restaurants and businesses adopt vegan recipes, the demand for pea protein will surge owing to its use as protein content for vegetarian meals, which will in return fuel the global pea protein market growth. The demand for proteins across the sports sector has also been complementing global pea protein market growth. Lately, several professional athletes including renowned names like Venus Williams, Tom Brady, and some NBA players are proving that a plant-based diet can fuel excellence. For instance, Kyrie Irving, player for the Boston Celtics of the National Basketball Association chose a plant-based diet over the offseason in 2017 to improve his performance. He later revealed his positive health and performance updates from switching to a plant-based diet. The growing popularity of veganism among sports personalities is bound to drive the demand for vegetarian sports supplements or protein powders. The increasing use of pea protein in sports nutrition products will thus drive the industry trends across myriad geographies in the years to come. A report by Global Market Insights, Inc., claims that Germany pea protein market size from sports supplement applications is anticipated to record a CAGR of 11% over 2018-2024. The growing demand for milk alternatives is another significant factor augmenting the pea protein market, particularly due to rising cases of lactose intolerance and increasing demand for plant-based milk. As per Genetics Home Reference, about 65% of humans have a reduced capability to digest lactose post infancy. Lactose intolerance is most prevalent among East Asian adults, affecting over 90% within this community. The condition is also common in certain European nations like Finland, where it affects 1 in 60,000 newborns. A survey conducted on 2,006 adults unveiled that 48% of Americans purchase both vegan and dairy milk varieties. However, over 51% believe that vegan variety offers more, or equal protein quality compared to dairy. Meanwhile, UK’s sale of dairy-free milk surged by 30 percent between 2015 and 2017. Owing to the rising demand for plant-based milk, Whole Foods recently unveiled that it will be introducing the first range of pea milk products in the UK by Mighty Society. Shifting food and beverage consumption trends such as the aforesaid are expected to massively drive the pea protein market growth in the years ahead. Indeed, it comes as no surprise that the pea protein market size is estimated to cross $160 million by 2024, driven mainly by paradigm shift toward vegan and vegetarian diets. This entry was posted in FOOD, NUTRITION AND ANIMAL FEED and tagged APAC Pea Protein Market, Canada Pea Protein Market, China Pea Protein Market, Europe Pea Protein Market, Global Pea Protein Market, Japan Pea Protein Market, Meat substitutes, Nutraceuticals, Pea Powder, Pea Powder Protein, Pea Protein, Pea Protein Market, Pea Protein Market 2019, Pea Protein Market 2024, Pea Protein Market forecast, Pea Protein Market growth, Pea Protein Market PDF, Pea Protein Market Share, Pea Protein Market Size, Pea Protein Market trends, Pea Proteins Market Analysis, Protein Powder, Sports Supplements, U.S. Pea Protein Market, Whey Protein, World Pea Protein Market.